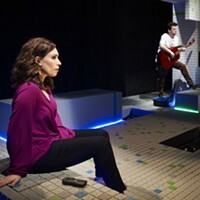 This touring production is scaled down. But I think that's why I enjoyed it. Pittsburgh CLO's production of The Little Mermaid might be the Disney-movie-turned-into-a-stage-musical for people who don't like Disney-movies-turned-into-stage-musicals. Judging from my reaction to such previous shows as Beauty and the Beast, Mary Poppins and The Lion King I'd say I'm an enthusiastic member of that club. But there I was, enjoying The Little Mermaid — and I've been trying to figure out why. Based on the Hans Christian Andersen fairytale about a mermaid who falls in love with a sailor (and girl, haven't we all been there! ), the success of this 1989 film reinvigorated Disney's moribund animation department. Interestingly, of the stage shows mentioned above, Mermaid's 2008 Broadway production was the least successful. 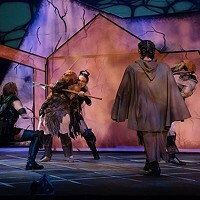 This CLO production is part of a mini-tour originating out of Papermill Playhouse in New Jersey. While an important regional theater, Papermill is still a regional theater, and a tour of its production is going to be scaled down ... which this is. But I think that's why I enjoyed it. 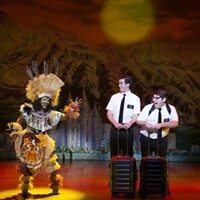 Beauty, Lion King and Poppins — at least the versions I saw — were huge, overblown spectacles completely at odds with the tiny stories they were telling. But this production has what it needs to get us from mermaid Ariel's opening yearnings to her curtain-call happiness. 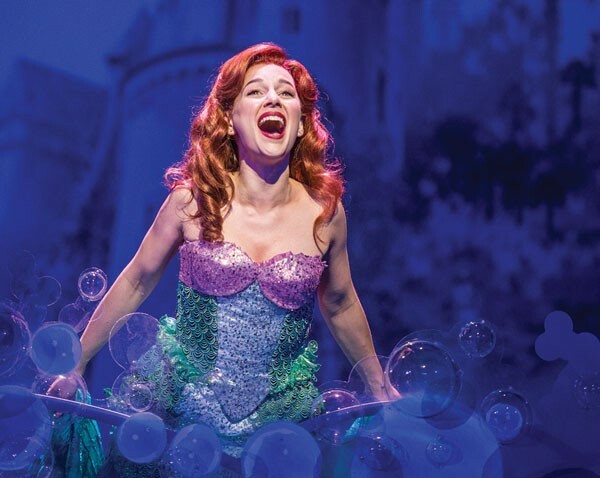 Jessica Grové couldn't be more adorable as Ariel, singing with a beautifully strong voice. The typical Disney-princess male love interest is always the weakest character — and Nick Adams as Prince Erik can't fight that — but he's an amazing dancer working a pretty good set of pipes. The original Disney animators based the villainess, Ursula the Sea Witch, on the late Divine, so I've always enjoyed her; Liz McCartney wrings every single joke out of the role, and she's a big reason this show is so much fun. Ron Wisniski and Alan Mingo Jr. know their way around landing a gag as well. The costumes, based on the original Broadway design by Tatiana Noginova, provide humor and razzle-dazzle. I was gonna close with a lame joke about Fantasia coming soon to Broadway — but you know some Disney "imagineer" is probably working on a dancing dinosaur costume right now.